The ingenious circuit of Monsieur Lacault-Part II. The L1 Ultradyne receiver was not the only one designed by R.E. Lacault, he designed several others: the Ultradyne L2 and L3, the LR4 and the R.E.L.9. Were each an improvement over the previous one. But what he called his masterpiece was the R.E.29 receiver, the last of the series. In the mid-twenties a new type of tube with four electrodes, the Tetrode, was introduced. The addition of a grid, the so-called "screen grid", which isolated the input grid (or "control grid") from the plate (or anode) allowed to obtain a more stable amplifier circuit and a higher gain. The tetrode was invented by Dr. Walter Schotty (the inventor of the famous Diode) in Germany, the patent application was applied in 1916 with No. 300,617 (a U.S. Patent, No 1,537,708 was released to him in 1925) but reached the "popularity", in particular in the United States, at the end of the twenties through the development and production of General Electric. The new grid inserted between the control one and the plate, polarized by a positive voltage lower than the anode and acting as an electrostatic shield, lowered the capacitance between them. This condition led to the elimination of any spurious oscillations and then to a more stable amplifier and with a higher amplification factor , no neutralization was necessary (which was usually done with the triode) in the RF and IF amplifiers stages, and allowed to reach higher frequencies. 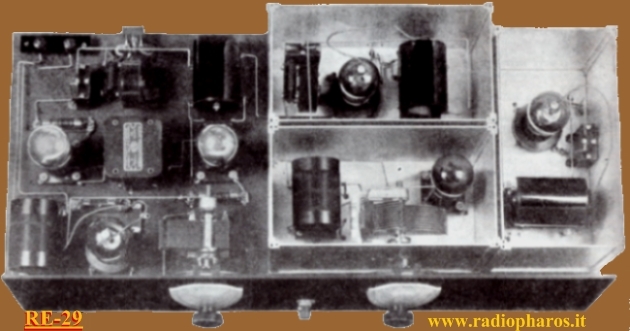 Probably the idea of using tetrodes in his receivers came to Lacaut at the end of 1928 in fact the RE-29, he designed and that was introduced in 1929, was using three of them. The intermediate frequency amplifier stages of this receiver had three tetrodes working stably and with high gain at 120 kilohertz. These stages, being of grat amplification, had a metallic cylindrical screen on tubes (see figure) and were screened each other (as was also the local oscillator) to prevent spurious couplings and then autoscillation. The shielding system was very original because it consisted of aluminum boxes with sliding walls (see photo). The modulator tube (it is at left in the photo) was not shielded by one of this boxes being of low amplification and having already a metallic shield slipped over it. 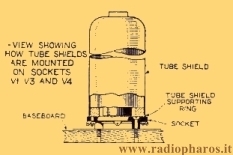 The antenna and oscillator, designed to cover the Medium Wave band, were wounded on supports with plugs so as to be interchangeable in order to receive, with appropriate coils, other frequency bands. I will not dwell more in the description of the RE-29 because what is most interesting it's the mixer or modulator tube. Lacault used his mixing circuit or Modulation System he invented. "The voltage (that of the oscillator) is alternately positive and negative: the positive loops of this voltage are modulated by the signal impressed on the grid of the first tube (mixer). The modulator (or first detector) established a high detecting (mixing) efficiency because the impedance of the load on the tube is high for the detected frequency (IF) and low for the signal frequency (RF). The fixed- tune circuit L3 (primary) C3, is parallel-tuned for the intermediate frequency, and his impedance or resistance is extremaky high. The condition for low impedance at the signal frequency (RF) would not be met were not the signal frequency always much different for both the intermediate frequency and the oscillator frequency. Currents of the signal frequency pass through C3 with practically no impedance. Likewise they pass through either C2 or the secondary of the L2. If the higher frequency of the frequency setting of the oscillator is used, the signal frequency is lower, and hence passes through the coil. If the lower oscillator frequency is used, the signal frequency is high and therefore passes through the condenser C2. This is a band-pass filter action." N.B. What added between brackets in yellow are my notes. "When I placed my hand near the antenna binding post of the RE-29 that I had just completed there was enough field strength to produce signals from every local station in New York City, proving that the new circuit was amazingly sensitive." Lacault dedicated his failing strength, but always with a brilliant mind, to complete the construction and description of this receiver, he died a few days later. 1- The Strobodyne circuit is often erroneously credited to Lacault, actually it was invented in 1927 by Lucien Chrétien in France. The Strobodyne superheterodyne mixer circuit was very interesting, it was exploiting a triode as a converter in an autoscillating switching circuit. Chrétien compared it with the strobe effect, hence the name Strobodyne. Later he modified it using two separate tubes, this circuit resembled in part to the Ultradyne.